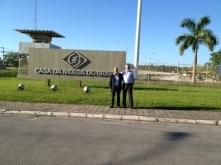 Also CASA DA MOEDA DO BRASIL is now benefiting from the PROTEC sheets counters for their security products! A PROTEC CT3 full optional has been recently installed at their worshop for plastic cards production. The original counting technology of .BMATIC has once more proved its effectiveness both for the paper and for the plastic sheets up to 800 microns, for the maximum level of flexibility. In cooperation with our local dealer, the company Afterprint Advice Bureau, B.MATIC will be showing the latest novelties in sheets counting at this specialized exhibition unique in Europe for its style! Will be showcased the new version of PROTEC sheets counter with stainless steel knock ups and the entirely graphic touch screen interface. Morevoer, it will be possible to see the video of the brand new PACK MOVER LP, automatic sheets counter fed directly from the guillotine. Great success of B.MATIC products at its first exhibition in Russia! In cooperation with SUPPLY LAND, main local distributor of Graphic Arts Equipment, B.MATIC received many inquiries from Customers interested in sheets counting. Great appreciations have been expressed by russian Customers for the DUAL SYSTEM technology counting without sheets deformation nor scratching. The tight link with the spanish market is renewed! In cooperation with MKM COMERCIAL, main local distributor of Graphic Arts Equipment, B.MATIC showcased both the new version of PROTEC CT3 sheets counter with stainless steel air table and robust knock ups structure to facvilitate the paper alignment, and the innovative and compact automatic sheets counter PACK MOVER A4 to count and split the sheets piles A4 and A5. This equipment can feed automatically the binding machines.